The Geronimo Rig is an accurate and affordable recreation of the holster and belt he was wearing when he surrendered for the last time on September 4, 1886. The Geronimo Rig marks a finely-crafted new addition to 45 Maker’s holster line. 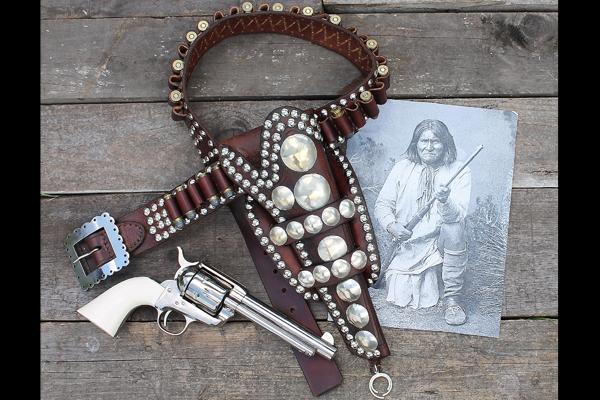 An accurate and affordable recreation of the holster and belt Apache leader Geronimo was wearing when he surrendered for the last time on September 4, 1886. The Rig includes a Mexican double loop holster and cartridge belt; hand cut, hand sewn and hand tooled just as Geronimo’s original was made. All Conchos, the Belt Buckle and the Naja Double Crescent Amulet are handmade in their Custom Shop. A deluxe version with hand engraved Conchos, hand engraved Belt Buckle and the Naja Double Crescent Amulet made of Sterling Silver is available on a custom basis. The manufacturer suggested retail price for the Geronimo Rig by 45 Makers is $235.00. See below for additional details. * Hand cut from Heavy Skirting Leather available in Dark Brown or Antique finish. * Handmade Apache Naja Double Crescent Amulet. * Available for the Colt SAA, italian clones and Ruger New Vaquero. 45 Maker is a Utah-based manufacturer of authentic holsters, belts and rigs from the mid-1850s to the mid-1890s without using any electrical machinery, similar to the way it was done in any small leather workshop in the rural American and Canadian west. 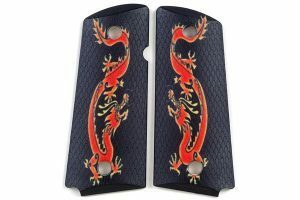 “All of our holsters and cartridge belts are hand cut, hand sewn, hand stamped and hand carved by using a sharpened tool from premium heavy skirting leather, including our popular pre and post Civil War real brass end caps holsters, which feature engravings of famous 19th century patterns such as “Wavy Line with Stars” and the “L.D. Nimschke White Schaff” design, which are unique in the US market,” their official website states.